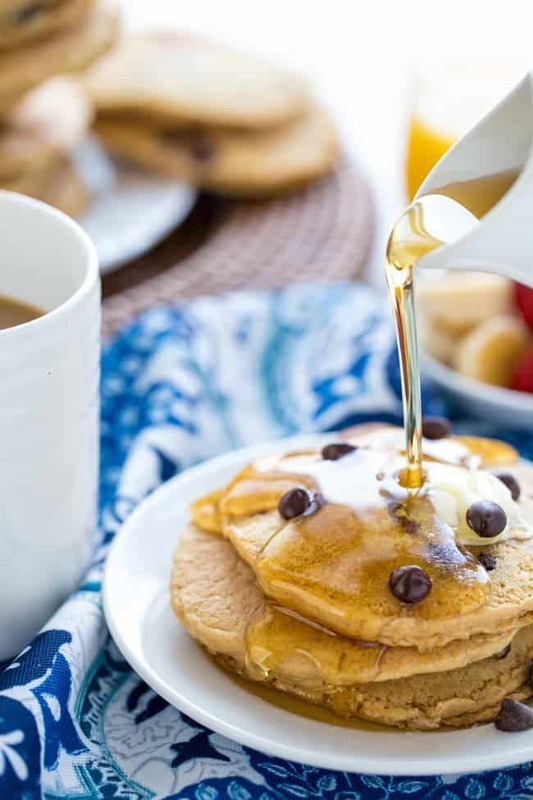 Having a Vegan Pancakes recipe as easy (and healthy) as this one in your arsenal is going to make you a badass brunching hero every weekend. These vegan pancakes have graced my kitchen about 5 times in the last 2 weeks. That’s how much we love them and why I have to bring them to you. They are now a staple in my kitchen and will soon become one in your own kitchen. Because let’s be honest – weekend brunching is everything. Is there anything better than getting to sleep in after a ridiculously long week of work? Enjoying a cup of coffee without having to rush around to get outta the house. Getting to actually cook (and enjoy) breakfast instead of grabbing a banana on the way out the door. Having meaningful conversation over said coffee and aforementioned breakfast with the ones you love the most. 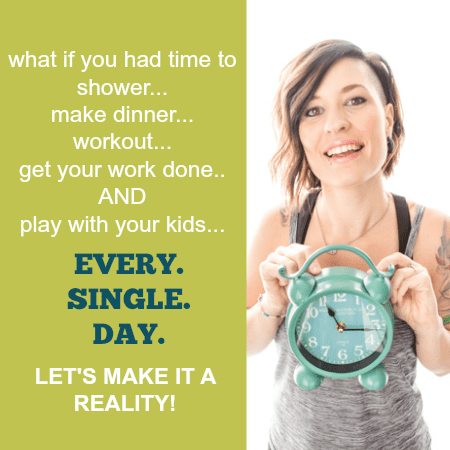 … and then curling back up on the couch or in bed with a good book or netflix marathon. Ok let’s be honest – my weekends are never quite THAT slow. I’m always pretty busy no matter the day. But they are definitely slower than the normal rush rush rush to get everything done Monday through Friday. So let’s talk about a weekend vegan breakfast situation. Cheesy scrambled eggs were my favorite. French toast a close second. Pancakes and waffles happened often. Uhhh, news alert! Every single one of those options went away when we went vegan, and I freaked the fuh out. I mean, it’s easy to realize that some of the obvious foods are off limits – cheese, milk, yogurt. But then you kinda forget about the foods that have those ingredients that you just don’t see. Like cake… you kinda forget that it’s made with eggs until you start looking at all the ingredients in every single thing you put in your body. And that is when I wanted to give up. Damn vegan life – taking away my favorite meal of the entire week. I truly wasn’t sure what I was gonna do. I tried reasoning with myself and saying I’ll be vegan for every meal except for Sunday brunch. But deep down, I knew that wouldn’t make me happy either. So I began my quest to make it more tolerable by coming up with delicious vegan brekkie options. Cause if I’m struggling with vegan breakfast, chances are high that you are too. What gives these Vegan Pancakes rockstar status? So I’ve made a lot of pancake recipes in the last 6 months, and many of them have fallen flat… quite literally. Sometimes they fall apart. Sometimes they are paper-thin. Sometimes they have no flavor. Sometimes they’re super dense and take about 6546 chews before being able to swallow. But then sometimes they’re perfect (you know, like the easy vegan pancake recipe I’m bringing you today). Let’s talk about all the reasons why this pancake recipe will be your new go-to on those slow-ish weekend mornings. How do I make these vegan pancakes? Ok, so by now, you’re drooling. 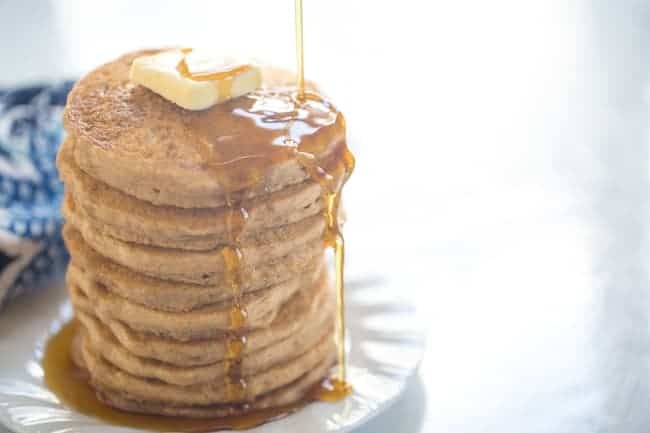 You can’t wait for the weekend to plate up a huge stack of these babies and drench them with syrup and fresh berries. But you wanna know, how easy are these easy vegan pancakes to make?? In a large bowl, whisk all the dry ingredients – the flour, coconut sugar, baking powder, and salt. Make a little well in your dry ingredients to add the wet ingredients to. Your non-dairy milk, oil, lemon juice, and vanilla. Once the wet ingredients have been added, gently whisk just the wet ingredients a little bit first before you start to incorporate all the dry ingredients. Mix until is just barely combines. You don’t want to kill the fluffiness! A few lumps are totally cool. Lightly oil a non-stick pan or griddle and bring to medium heat. Scoop out 1/4-cup of batter and pour onto the pan. When the edges of the batter are dry and bubbles have formed after a few minutes, flip and cook for another couple minutes until golden brown. Serve with toppings of your choice – fresh berries, nut butter, seeds, maple syrup, vegan butter. Whatever you like. How do I make the perfect pancake? 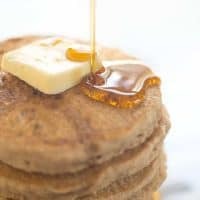 I’ve made pancakes hundreds of times and have picked up a few tricks for creating the perfect pancake that I thought could help. Don’t overmix the batter! I know I mentioned it before, but you literally want to stop mixing as soon as everything is combined. Don’t keep going in hopes to get every little lump out. I promise. That is a recipe for flat pancakes. You want gorgeous pillowy pancakes for that weekend brunch sitch. Test the temp of the pan or skillet. This is something I learned from watching my grandma make pancakes as a kid. Once you’ve heated your pan, you want to be sure it’s hot enough but not blazin hot. I put my hand under the faucet and then splash a few drops of water right onto the pan. If the water immediately evaporates and steams in seconds, it’s a bit too hot. No sizzle means it’s not hot enough. Learn to find the happy middle ground. You want your water drops to sizzle a bit and “dance” on the top of the pan before finally settling down. Don’t flip until bubbles have formed. You want to wait until the edges of the pancakes are dry and bubbles have formed all over. Take a teeny tiny little peek under the pancake to be sure it’s as golden as you’d like. And THEN flip. So that’s that. I have set you up for success for your vegan pancake makin’. Even better, you will now be able to save breakfast… weekend breakfast, to be specific, which is way more important than weekday breakfast, as we discussed. Once you get this basic vegan staple down, you can amp it up with some chocolate chips or blueberries. Actually, I just remembered – I have a dairy-free chocolate chip pancake recipe you may enjoy as well! Especially for any kiddos you’re serving on the weekend. 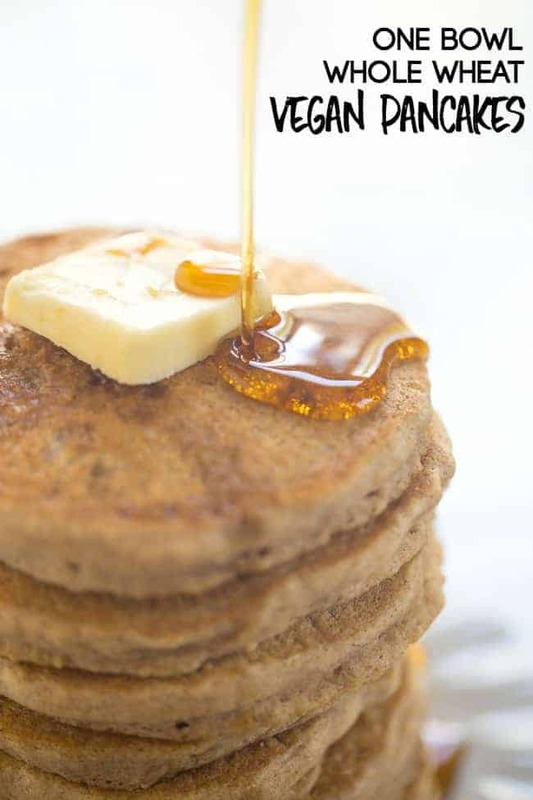 If you just need a good-ole healthy pancake recipe and aren’t into the vegan thing, no biggie. 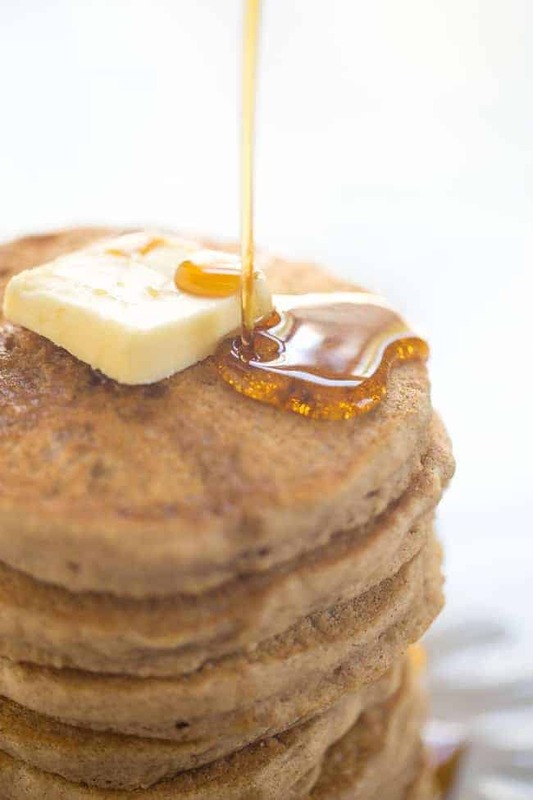 I’d totally give my friend Kristen’s whole wheat pancakes recipe a try! 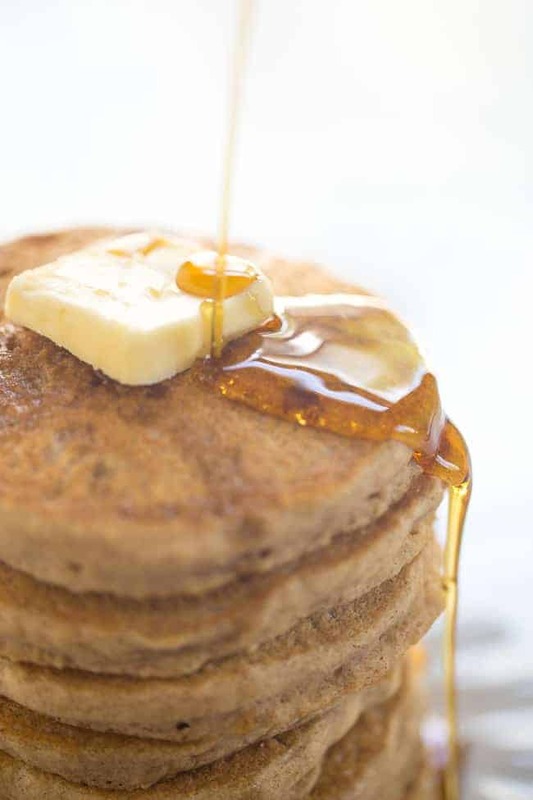 Or Michelle has a great gluten-free buttermilk pancakes recipe that looks to-die-for if that’s what you need. I’ll just be over here munching on my super easy vegan pancakes and trying not to hoard them all for myself. In a large bowl, whisk together the whole wheat pastry flour, coconut sugar, baking powder, and salt. Create a well in the dry ingredients and add in the non-dairy milk, oil, lemon juice, and vanilla extract. Carefully begin whisking just the wet ingredients, bringing them together before you start incorporating the dry ingredients. Mix all ingredients until just combined. Overmixing would kill the fluffiness, and a few lumps are ok.
Lightly oil a non-stick frying pan or griddle and heat to medium heat. When the pan is hot, use a 1/4-cup measure to scoop the batter onto the pan. Let cook for a couple of minutes until large bubbles start forming on the surface of the pancakes and the edges appear dry. They should be golden brown on the bottom. Flip and cook for an additional couple of minutes on the other side until golden brown and cooked all the way through.